How are these good examples of submerged symbolism? What do these image symbolize? How does it relate to other paintings we’ve studied? What symbols do they share? The first image is Merode Altarpiece by Robert Campin in Flanders, Belgium made in 1425. 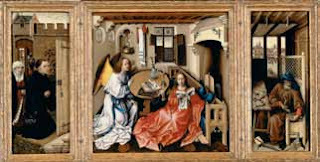 This image represents an Annunciation scene. The angel who is Gabriel and Mary are the center pieces. Mary is holding a book, which is the bible. Gabriel is somewhat kneeing to her to tell her the birth of Jesus. There are some symbolic background items as well, like a spirit of Jesus from the window above Gabriel. There is also a pot of water which is like holy water that is pure. There are 2 windows that are a crest flag and the candle light that has been blown away represents spiritual enlightenment. The right piece shows Joseph as the left piece shows the patrians and Peter. Peter is holding the key. There are some symbolic background items as well, like the rose that represents Mary and the birds who are messengers. 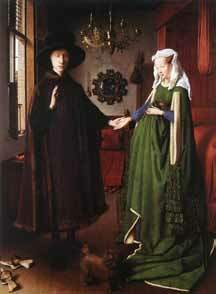 The 2nd image is Arnolfini Wedding by Jan Van Eyck located in Flanders, Belgium and this made in 1434. This painting is an Italian couple getting married. It's made in tempera oil pain. The couple are making a vow for their wedding with a candle to represent enlightenment. The wife is by the bed and she looks as if she is pregnant. They are bare feet on the Persian carpet that represent wealth. Their dog represents royalty. In the background, there is a mirror and the artist's signature and date of the drawing. The problem about the painting is that it was painting 13 years before the wedding happened and 6 years after the artist died. Thank you so much for commenting so much! Great work! Your analyses is a good starts but could be developed more and have more specific details and facts for an exam.